As any homeowner knows, your house has several drains that can become clogged for various reasons. 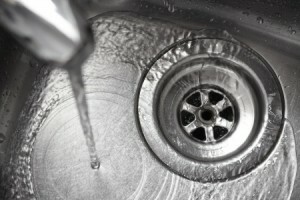 One of the drains that is most likely to develop a clog is your the drain in your kitchen sink. These drains are asked to handle the tough task of removing our food waste from our homes and transporting it to the sewer, helping to keep your home sanitary. Because a wide variety of materials are placed in your garbage disposal, and ultimately your kitchen drains, homeowners will need to clean the drains in their kitchen sinks periodically. This practice has been shown to prevent clogs and backups. A quick and easy way to clean your drains in your home’s kitchen is to use vinegar and baking soda. This combination of common household products is a cheap and effective alternative to the harsh chemicals found in many traditional store-bought liquid drain cleaners. Follow these steps for a quick and easy way to clean your drains. Rinse your drain by pouring a pot of boiling water down it. Dump 1/2 cup of baking soda into the drain. Mix in a cup of hot water. Allow the mixture to settle for a moment or two. Add 1/2 cup of white vinegar. Allow the reaction to clean the inside of your drain for a handful of minutes. Remove the drain cover and flush with another pot of boiling water. Sometimes, even this potent reaction isn’t strong enough to break through the most stubborn clogs. When you can’t get through a clog, you will need to call a professional at KRK Enterprises, and we will get your drains working again.